MEEKER | Imagine working with creatures that survived the dinosaurs and helping to capture butterflies unknown to science. That was the experience of 14 Meeker students who participated in the Ecology Project International (EPI) Costa Rica Sea Turtle Program June 1–10 this year. EPI engages students in hands-on participation in scientific research and conservation.This year, we spent two days at the Veragua Rainforest research station and four days working at the Pacuare Nature Reserve on the Caribbean slope of Costa Rica. 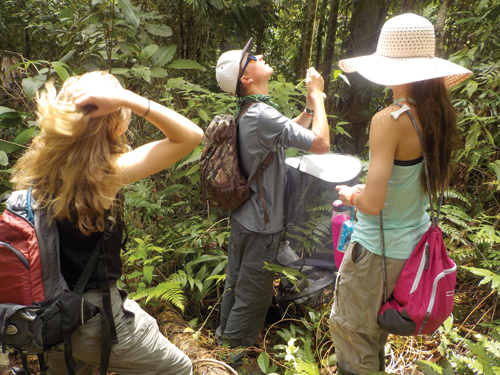 The Veragua field station introduces students to rainforest ecology. Accompanied by EPI instructors and field guides, we rode an aerial tramway through the canopy, providing a glimpse of the 3-D world among the trees. On a night hike, we saw red-eyed frogs, rare nocturnal butterflies, and other creatures otherwise hidden from view.During the day, we visited the station’s herpetarium, with its collection of amphibians and reptiles including (behind glass) bushmaster and fer-de-lance snakes that you would otherwise not want to meet. A highlight of the tour was a visit to the butterfly enclosure, with its collection of hundreds of native butterflies, brilliant colors darting among the foliage. Later, we helped set butterfly traps, dishes of mashed banana enclosed in netting and suspended in the forest canopy. Researchers at the station have identified three previously unknown species. Perhaps the traps we set will capture others. Immediately on arrival at the Pacuare turtle beach, we were briefed on the protocols for turtle patrol.At this time of year, female leatherback turtles come ashore at night to lay their eggs, and baby turtles from earlier nesting climb out of the nests (about a meter deep in the sand) and scuttle into the surf. We divided the night into four-hour patrols, three patrols each night, walking four miles along the beach with Pacuare research staff to scout for turtles. We were lucky to see adults and hatchlings, both. Students helped measure and tag the adult turtles, and one patrol re-located eggs from a nest that was below the high tide line. Leatherbacks date to the Jurassic period, 150 million years ago. Adults can reach up to 6 feet in length, up to a ton weight. As with all the marine turtles, seven species total, leatherbacks are critically endangered by human activities, including loss of nesting habitat (e.g. from development along turtle beaches), egg poaching, drowning in fishing nets, or ingestion of plastic debris. (Leatherbacks feed on jellyfish, and they are confused by plastic bags and other debris.) It is amazing to see these magnificent creatures emerge from the surf, to lay their eggs, and the babies, each about the size of the palm of your hand, scramble down the beach to the sea. As part of the program, students working in small groups planned and executed their own original research projects. We were doing real science, supervised by experts in the field. Later, we shared our results with local Costa Rican students who had also participated in the EPI program. One of the highlights of the trip was our visit to a local high school.Like other public schools in Costa Rica, Colegio Pococi provides general instruction in math, language, arts, and sciences. In addition, Pococi offers specialized programs in technology and agriculture. 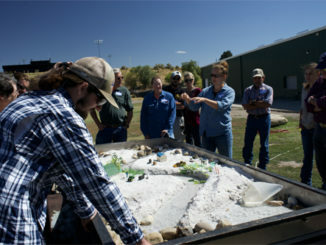 The curriculum is hands-on and project-oriented. Our ag students saw many familiar sites on our tour of the 200 acre campus, including a pig barn, chicken coops, rabbits, and dairy cows, plus aquaculture including tilapia and carp. Pococi students raise much of the food eaten in the school cafeteria. Last day of the trip we paddled whitewater rafts down the Pejibaye River. Heavy rains and high runoff had closed the world-class Pacuare River, but we had lots of fun in the smaller rapids of the Pejibaye, cutting through the lush green of the rainforest. A few paragraphs can’t do justice to a trip like this. We experienced a welcoming culture, new foods, a different language, unfamiliar climate, ecosystems of enormous diversity, and a unique way of life. We made new friends, learned a bit about the wider world and about ourselves. We plan public presentations about the trip and what we learned, and we hope to initiate projects to promote conservation and public awareness of leatherback and rainforest conservation. Thanks to our sponsors, especially the Meeker Regional Library District, Fairfield Trust and Lions Club, and the many individual donors who helped make this trip possible. These trips, and the growth experiences they provide, would not be possible without the generous support of our community. Thank you! Will Land and Water Conservation Fund rise once again? RBC | Rivers wind their way across our landscape, a delivery system for inland water, irrigation water for the food our farmers grow, drinking water for humans and animals, and habitat for wildlife.